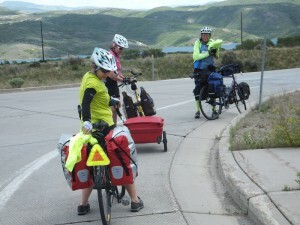 The overnighter group above Park City getting ready to descend to Hwy 40 at the Mayflower Exit. The Jordanelle Reservoir is in the background. The folks are (from left to right) Barb Hanson, Dana Morgan, and Cheryl Soshnik. When you think of a self-supported bike tour, you probably envision riding across the state or country for a period of time. Most people have trouble getting long blocks of time off and many feel that the logistics of a big tour is daunting. Just as a hike starts with the first step, a bike tour starts with the first night. 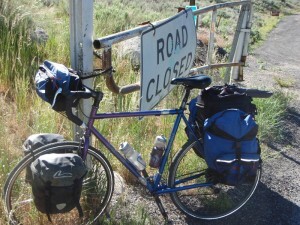 So why not just do an overnight bike tour? Not only does an overnight bike tour give the experienced bike traveler a little practice but it can give the novice the skills and confidence to either do more overnighters or plan for a longer trek. An overnighter can easily become a family outing. And finally, an overnight ride gives one a chance to try out equipment and refine what you put in your panniers or trailer. I’m personally trying out some lightweight chairs on my overnighters. My wife, Julie, thinks that it is too much trouble to pack for an overnight bike tour. I beg to differ so I end up doing most overnighters on my own when she is scheduled to work. I can completely pack my panniers in just under an hour using my “bike-tour” checklist. I could do this quicker by dining out to eat, eliminating my cooking gear, or forgo camping and go to a motel or cabin. Following are a number of options for overnight bike tours. Depending on how much time I have, my overnight destinations range from less than 2 hours to just over 5 hours of riding time. I will state if I have actually been to the places listed below. If a mileage is listed, it will be from the bottom of Emigration Canyon. Angie Vincent as she is getting ready to tackle the final steep and hard 1.5 mile uphill gravel section to Guardsman Pass. If the Pony Express RV Resort is too short of a ride, you could continue up the Legacy Bike Trail (LBT), exiting in Farmington for the Lagoon Campground (Lagoon RV Park and Campground. 375 N. Lagoon Dr. Farmington UT 801-451-8100). According to the website ( www.lagoonpark.com/parkInfo/camping ) rates start at $30. Planning enough time to enjoy Lagoon could be an added attraction for the youngsters. Also in Farmington is Bountiful Peak Campground, located 9 miles on Forest Service 007 via 100 East. Continuing further on the LBT, you could go to the Cherry Hill Campground in Kaysville. (www.cherry-hill.com/ ) call 801-451-5379 for questions. It is located at 1325 South Main Street in Kaysville. Camping prices start at $30, plus taxes. You can spend additional money on miniature golf and other amenities, again making it kid friendly. I have not been to this campground so I am unable to direct you to it from the Legacy trail. As an added bonus for the children, you could coordinate an overnight bike trip with a one-way ride on either the TRAX or FrontRunner trains that lie closely to the Jordan River and Legacy bike trails. For those that want a longer tour one can cross the Wasatch range to Summit or Wasatch counties. When I have more time, I enjoy traveling to the state parks of Utah. Rockport, Wasatch Mountain, and Rock Cliff are the three destinations that I have visited on my bike. Jordanelle State Park is one I have not experienced. My favorite state park was Rock Cliff. Despite the state’s desire to takeover federal lands, Rock Cliff (about 53 miles) was closed due to state funding cutbacks. However I just exchanged emails with Rock Cliff’s former Ranger/Naturalist. She informed me that Rock Cliff is again open until Labor Day. Rock Cliff is south of Kamas near the small town of Francis on route 32. It sits on the southeast corner of Jordanelle State Park and is technically part of Jordanelle State Park complex. I realize that many cyclists do not want to ride on I-80 over Parley’s Summit due to the highway traffic, however this will be the only traffic you encounter, with the rest of the route on frontage roads through Park City and then the back roads through Kamas. With (what I thought was) the closing of Rock Cliff campground, Rockport State Park, (40 miles) stateparks.utah.gov/parks/rockport, has been my destination of choice for a longer overnight bike tour. The “walk-in” campsite (Cedar Point) is the furthest campsite in the park at 3 miles from the entrance. However, Jupiter campsite is ¼ mile away, the only campsite that has a shower. Cedar Point has a $10 fee (plus $2 if you use the shower at Jupiter) with Jupiter at $20. Rockport is located on route 35 a few miles west of Browns’ Canyon road. 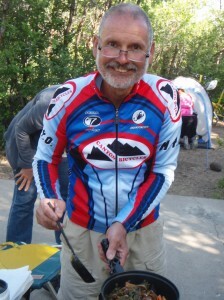 Because of the closing of Rock Cliff, the Utah Bicycle Touring Society went to Wasatch Mountain State Park in Midway this year. I wasn’t aware that the campground is approximately 2 or more miles up a rather steep ascent from the visitor center adding a difficult ending to the 43-mile route. The tenting area was not nearly as full as I expected for a June weekend. So, you will have to decide if you want to ride there with or without a reservation. Reservations cost an additional $8 at any of the state parks. The basic camping fee at Wasatch is $20. Reservations at any of the State Parks can be made by calling 1-800-322-3770 or 801-322-3770 from Salt Lake City area or online at www.stateparks.utah.gov. To get to Wasatch Mountain State Park, it is worth trying to avoid Route 40. Fortunately I can avoid much of route 40 by riding through Park City and Deer Valley with: http://www.mapmyride.com/routes/fullscreen/68950996/. For those who like to ride mountains, you can take the turn off below Brighton to go over Guardsman Pass. Coming back from Wasatch you will have a 7-mile ride with up to 20% grades and a mile of gravel to travel. My wife said she would not do it again even though it shortened our ride by nearly an hour. For those living in the south end of Salt Lake County you can ride to Wasatch Mt. State Park via Orem. http://www.mapmyride.com/routes/view/83143321. 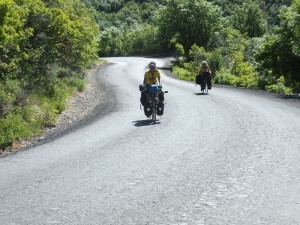 There are several options for overnight bike tours by riding towards Morgan, Utah. For the bike traveler that packs light or doesn’t mind a long climb you have several options after riding over both Big and Little Mountain summits (AKA East Canyon and Emigration summits). Yes it is a tough climb over East Canyon summit but you get to descend to your choice of East Canyon Resort or East Canyon State Park. (20 & 24 miles). East Canyon State Park has little shade compared to the resort and may not be your destination of choice on a hot day. See www.eastcanyon.com/ for the resort and http://stateparks.utah.gov/parks/east-canyon for the park. If you continue on past East Canyon State Park on route 66 to go to Morgan (40 miles), you can camp at the golf course. I was charged $5/person when I went there this spring (includes showers). To get to the Morgan golf course exit onto 100 North all the way to the golf course, a 4-mile ride off of the main road. There is a grocery store in town near I-80. If you go to the grocery store you can get to the golf course by taking a right onto the road just before the freeway. This road takes you through “old Morgan”, over a bridge and then to the golf course. And finally, let’s not forget the campgrounds up Big and Little Cottonwood Canyons. It gets hot in the summer and a ride up to a cooler climate can be just the ticket for relief from the heat. Redman campground is 9 miles up Big Cottonwood and the Spruces Campground is a few miles higher. Tanner’s Flat (rode there last year) and Albion Basin are halfway up and all the up Little Cottonwood. There is self-registration on site or at www.reserveusa.com or call 877-444-6777 for reservations according to the book, The Best in Tent Camping-Utah by Jeffrey Steadman. 4 Responses to "Overnight Bike Tours from Salt Lake City"
Is it possible to bike from Salt Lake to Park City w/o going thru Big Cottonwood? I have a friend biking from SLC to Denver. Can he get to PC by going thru Immigration Canyon to frontage roads that parallel I-80. Will those roads take him to Park City so he can pick up Rt 40? Yes. He can take Emigration and drop down to Parley’s. Then ride the shoulder of I-80 to Parley’s Summit, then ride frontage roads on the South side of I-80 to US-40. Or, he can go into Park City and connect to 40 using 248. Have you ever tried Salt Lake to Jordanelle via Provo canyon? Midway and Heber are beautiful, but I am concerned about the traffic up the canyon. I think it has a wide shoulder the who way though. Pingback: Airport Trax Line to open, connect Daybreak to even more places.